At the time the documentary Burroughs: The Movie was released in 1983, author William S. Burroughs was a counterculture legend but existed largely under the popular culture radar. Director Howard Brookner had spent five years working on it with the writer’s consent and this gave him access to his contemporaries, like Francis Bacon, and artists he influenced, like Patti Smith. For years, this documentary had been relegated to obscurity and only available in sub-standard prints. In 2012, Brookner’s nephew, Aaron, launched a Kickstarter campaign to have the film restored and this new Criterion Collection Blu-Ray is the product of his and many others’ hard work. What struck me about this film was what an intimate portrait of Burroughs it is, digging deep as it tries to understand and articulate the man’s worldview, which was quite complex as evident from densely textured books like Naked Lunch and The Nova Express. And so we have scenes of him talking quite warmly about old friends and then in other scenes he channels his trademark paranoia as he describes an international terrorist organization he’d like to create in order to protect gay people. Burroughs: The Movie manages to capture the cut-up technique that the writer pioneered in his own work and also his wonderfully sardonic wit, which comes through in his distinctive southern drawl. 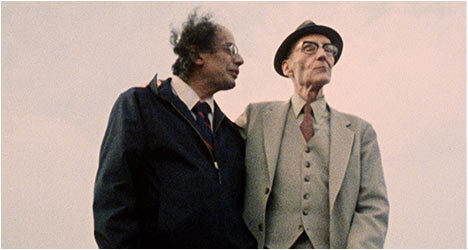 Highlights include Burroughs walking through his hometown reminiscing about how badly he was treated in his youth and we also see him in New York City, where he lived at the time that documentary was being film, reuniting with Beat Generation contemporaries Allen Ginsberg and Herbert Huncke. These moments come off as oddly uncomfortable but Ginsberg’s trademark charisma breaks through and livens up the moment. Burroughs: The Movie takes an unflinching look at the man and his life, refusing to romanticize the writer, opting instead to portray him on his own terms. It is a fascinating document of Burroughs a few years before pop culture rediscovered him thanks to his memorable minor role in Gus Van Sant’s Drugstore Cowboy (1989), which opened the floodgates and saw him collaborate with the likes of Ministry and Kurt Cobain. Burroughs remains a fascinating figure to this day and this documentary is a must-see for anyone interested in him. Burroughs: The Movie was assembled using multiple film formats and so the image quality varies but never in a bad way – rather one that preserves the way in which it was made, which actually fits the experimental nature of Burroughs’ own work. That being said, the film has never looked better. There is a new audio commentary by filmmaker Jim Jarmusch who worked as a sound recordist on the documentary. He talks at length about how he got involved, working with Brookner, and his knowledge of Burroughs. Howard Brookner is interview by Burroughs biographer Ted Morgan from 1985 and they talk about how the documentary came together. Brookner’s nephew Aaron is also interviewed and he talks about the campaign he spearheaded to get his uncle’s film restored. A real treat for fans is over an hour of rare outtakes that include interview subjects like Andy Warhol, Patti Smith, Brion Gysin and others. Also included is 30 minutes from the New York Film Festival premiere in 2014. There is a Q & A with Jarmusch, Aaron Brookner, filmmaker Tom DiCillo, who also worked on the documentary, and Burroughs’ friend and manager James Grauerholz. Finally, there is an experimental 23-minute edit of the documentary by photographer Robert E. Fulton III, which was ultimately rejected by Brookner because he wanted a decidedly more linear approach.